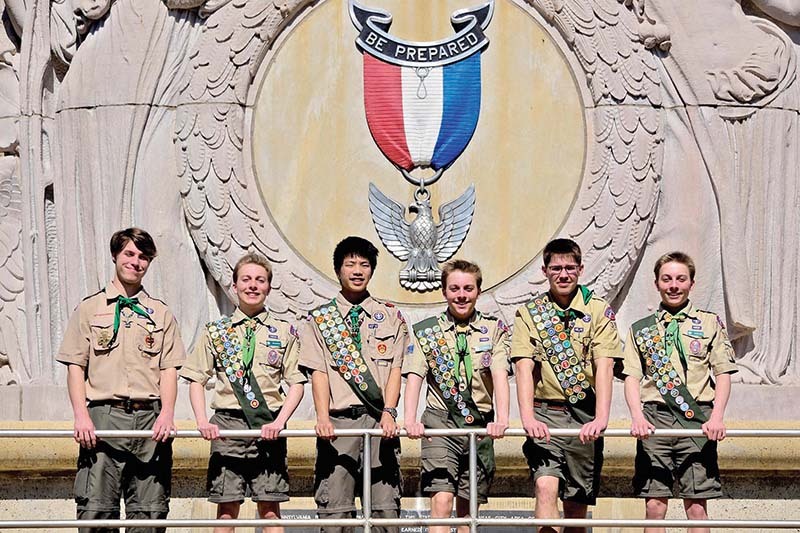 LEAWOOD — Six new Eagles celebrated reaching the highest rank in Boy Scouts at an April 9 Court of Honor at Curé of Ars Church here. While these celebrations are rare — historically only about two percent of boys who begin scouting reach Eagle rank — this group of Eagles is both unique and rare: three — Aidan, Bennett and Christian Hense — are triplets and two — Jesse and John Long — are twins. And the sixth, Henry Reilley, was adopted at the age of 5 from an orphanage in China. The triplets’ interest in nature, birds and animals and their love of exploring and being outside initially drew them to Scouting, said their mother Jennifer Hense. As they grew older, she said they developed an “affinity for water,” which also became a part of their journey to Eagle. Aidan said kayaking and lakefront badges were his favorite activities. Bennett said earning the Mile Swim award, something all three brothers achieved, was a highlight, and Christian said he most enjoyed learning to sail. Hiking, biking and rock climbing challenged John and Jesse Long, and both earned the 50 Miler hiking award. Each said his favorite Scout experience was Philmont Scout Ranch in New Mexico, which included climbing Mount Baldy. John recounted limping his father up the mountain after he “blew out his knee,” while Jesse remembered the fun of running down the mountain. Henry Reilley is known as the “fire god of Troop 395.” His love for building fires began when he was a Cub Scout, where he learned that preparedness at campouts was important. He said that his passion for building fires reminds him that Scouting is not all about going through the ranks, but also about having fun. He won second place in a speed fire building completion last summer and came prepared on Holy Saturday to help the troop light the paschal fire. An Eagle Scout project is a capstone and one of the last steps to being awarded Eagle rank. Each Eagle candidate is required to initiate, plan, develop and serve as a leader in a service project helpful to his religious institution, school or community. John chose to design and build large bird jump boxes for Lakeside Nature Center in Kansas City, Missouri, because he liked the idea of doing something for eagles and other large birds. Jesse designed and built raised garden beds as part of an outdoor classroom at Martin City K-8 School in Kansas City, Missouri, which he attended as a child. He said the project taught him how difficult it is to be a leader. Giving the orders “felt weird,” he said, after being used to following the lead of others. Aidan landscaped and refurbished the grotto at St. Agnes Parish, Roeland Park. Bennett conducted a fundraiser and product drive benefiting Giving the Basics, a Kansas City, Missouri, charity that provides personal care hygiene products to people in need. Christian designed and built a nature walk for Our Lady’s Montessori School in Kansas City, Kansas.